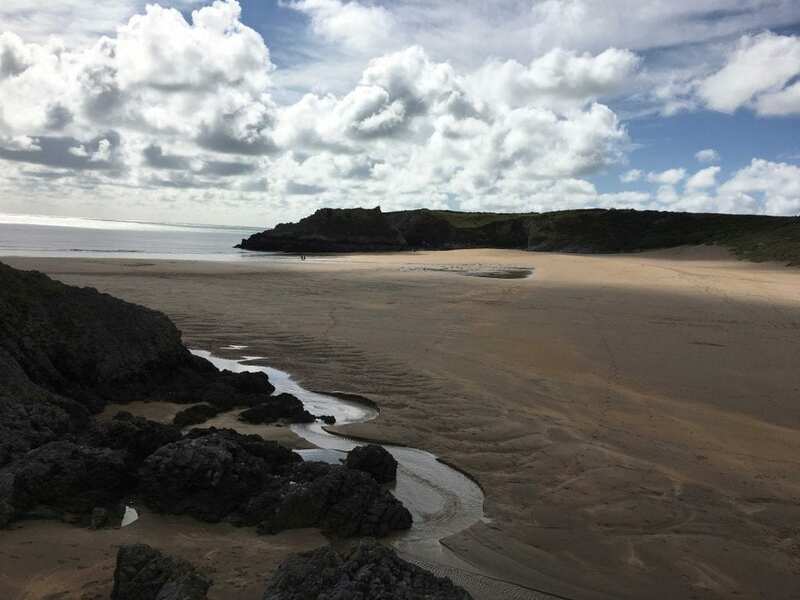 While many trekkers seek fields afar for their trekking Nirvana, Mark Bibby Jackson discovers his stroll along the peaceful Pembrokeshire Coast Path a relaxing experience, despite a false start. Somewhere during the third round it suddenly dawned upon us – we might actually win. If only we had known more about Central American humming birds or the chemical formula for hydrochloric acid, then our victory would already be in the bag. We were the Portclew Four, a quiz team rather than a Plaid Cymru splinter group demanding Welsh Independence, named after the Georgian Portclew House in which we were staying. On my drive up earlier in the day, the weather had settled in the further west we ventured – welcome to Wales it was saying, as a layer of mist and drizzle, or mizzle as my mother calls it, engulfed us. Dylan Thomas’ famed valleys may well be green beneath, but all I could see was a murky greyish-white sheet. With time on our hands we descended upon the local pub – there is only one in the village of Freshwater East – to discover that tonight was the monthly quiz night. “David Bowie.” Gordon, a fellow member of the Four, whispered in a low Scottish voice that could be heard in his native Aberdeen. Well, at least that was one point we could all share. Freshwater East is best known for its long sandy beach I was to discover the following day as I emerged unscathed but not exactly clear headed from both the quiz and the hospitality of the locals at the Freshwater Inn, where my mother had discover aperol. Driving along the coastline and into the shallow dip that leads to the village of Stackpole, I wondered where all this spectacular beauty had been hiding the previous day. My destination was Stack Rocks, the final point along the Pembrokeshire Coast Path on the Celtic Sea before it heads north and follows the Irish Sea. There I was to walk back to Freshwater East, while my co-pilot and mother drove the car back to Freshwater East. Thus sparing me of the task of working out the coastal bus timetable. Or at least that was the plan. The Maldives perhaps or Thailand, even Southern Spain or the Algarve, but El Costa del Pembroke surely not? At breakfast we had been cautioned that the final part of the coast path might be closed if the artillery range through which it passes was in use. “Don’t worry there will be red flags up,” our host Sarah Jackson – no relation – reassured us, sensing our concern about becoming collateral damage in the army’s preparations for the next invasion. After all, 1066 was a long time ago. What Sarah had forgotten to inform us – well me – was that the “road ahead closed” signs really did mean that the road ahead was closed, and that I would have to turn the car around at some point. Throwing the car into reverse, I spun round without checking that the friendly-looking grass verge was in fact a grass verge, rather than a short patch of grass with an unforgiving, solid brick wall lurking behind it. A list of all Travel Begins at 40 articles on Pembrokeshire. One broken back tail light and a dent in a bumper much larger than the one in my ego made me see the error of my ways. Now, I have never been one to be deterred by the slightest mishap – large ones have me heading for the nearest exit ­– but small ones see the best of me. So, once I had stopped doing my best impersonation of Hugh Grant at the start of Four Weddings and a Funeral and we had ascertained that the damage to the car was not terminal, we – well mum really – concluded there was little point in letting a negative start ruin what was, weather-wise at least, and contrary to all expectations the previous evening, a rather beautiful day. Having eventually completed my ill-fated reversing manoeuvre, I set off in search of St Govan’s Head, which Sarah had earlier informed was the alternative starting point for my walk should the firing range be in use and I had been stupid enough to prang my mother’s – did I forget to mention this slight detail earlier? ­– car. St Govan’s Head is a large promontory with a car park handily placed for those people wise enough to take in the meaning of “road ahead closed”. Before I had even left the car park a male rambler, with two female companions, came up to share his appreciation for the impact my driving skills had had on the car. As we male-bonded, – “You should have seen the other one.” “It was a wall.” – the three women seemed content to let us talk manly inconsequence. “They can take that out easily enough,” my new blood-brother said – accurately as it transpired – of the dent in the bumper. Thus reassured, though I had absolutely no idea whether my new acquaintance was part of the Ferrari pit crew or Mr Beans’ brother-in-law, I set off along my path, as Mum drove the car back to the guest house. When you think of going on a beach holiday it’s unlikely that the words West Wales are the first to pop in your mind. The Maldives perhaps or Thailand, even Southern Spain or the Algarve, but El Costa del Pembroke surely not? However, the now truncated stretch of the Pembrokeshire Coast Path that I was to walk along has some of the best beaches in the UK. The top one Barafundle Bay was recently voted one of the 25 best beaches in the world by Passport Magazine, ahead of Copacabana and Bondi to name but two. Now I am by nature a cynic. And, furthermore, a cynic who has seen some pretty impressive beaches in my travels. So I take such things with a very unhealthy shovel of salt. As I walked along the gentle, meandering downs, while sticking to the path mindful of the Danger UXO notices and the distant noise of the unseen fighter planes, I soon found myself enjoying my stroll with hardly another rambler’s backpack to be seen. Then I saw it; a beautiful curved bay of golden sand, half in sun and half in shade, opened up before me. I paused for a moment to fully appreciate the beauty of the spot, a “wow” involuntarily slipping from my lips. This truly was spectacular. The only thing was that it was not the beautiful, bewitching Barafundle Bay, but nearby Broad Haven South a mile or so to its west that I was beholding. Navigating the path down to the beach with greater success than my driving earlier, I reached the near deserted sands, and as a true British tourist removed my walking boots and socks so I could dip my feet in the cold waters. If this beach is so spectacular, then Barafundle Bay must be pretty special, I mused. It didn’t take long for my scepticism to return refreshed. Barafundle might be a fine beach in its own right, but Broad Haven South it is not. Perhaps my view was tempered by the droves of day-trippers – I had come for three days and two nights after all – persuaded to venture here by the bay’s award-winning renown, but I felt slightly short changed. I didn’t pause to dip my feet, although I admit to being impressed by the woman who bared almost all to swim against the waves. In its literature on the Stackpole area in which both beaches lie, the National Trust describes Barafundle Bay as “brilliant for family adventure”, while Broad Haven South “offers a wilder experience.” I know which one is more my cup of tea. And if it’s a good brew that you are after then The Boathhouse Tea-room, a few hundred metres along the coast path in Stackpole Quay, is just the ticket, and most refreshing for a mid-walk break. The nearby village of Stackpole adjoins a 2,000-acre estate established by the Cawdor family. The many trails around the estate grounds of the former Stackpole Court pass through dense woods and around some ponds. The highlight of this is the Walled Gardens, which were created between 1772 and 1782 and run by the appropriately named FG Garlic and his family until recently. For many the true delight of the village is the local pub, the Stackpole Inn, which has won many awards including Best Pub and Bar in Wales at the National Pub and Bar Awards in 2016. Pembrokeshire, like much of Wales, is a land dominated by war and castles, many of which have fallen into a glorious state of disrepair. Pembroke Castle is an impressive medieval castle that dates back to 1093, although it was totally reconstructed in the late 12th and early 13th centuries. It is here that Harri Tudur was born in 1457, before going on to defeat the horseless Richard III in the Battle of Bosworth Field some 28 years later to found the Tudor dynasty as Henry VII. Myself, I prefer my castles, like my beaches, less well-preserved. And in the nearby village of Lamphey I found just the ruin I was after. 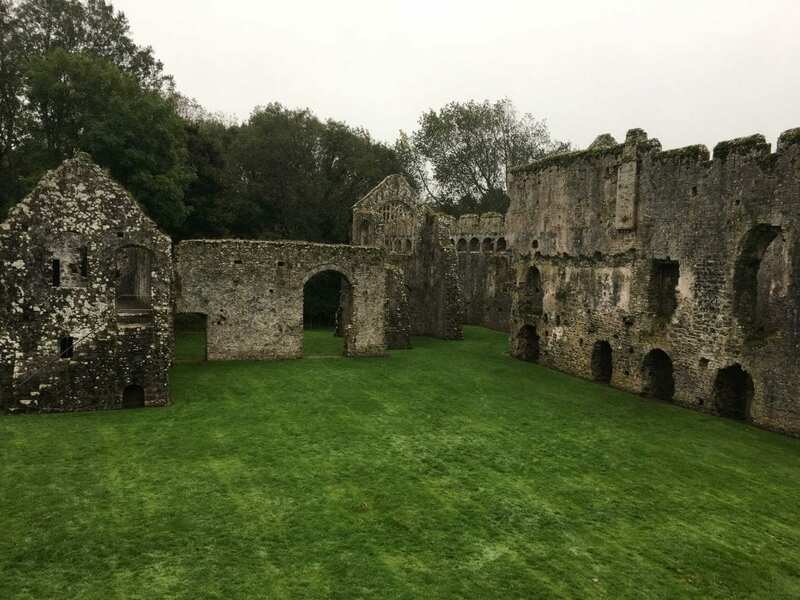 Built in the 13th century, Lamphey Palace was a favoured retreat of the Bishop of St Davids, which presumably accounts for its moniker as the Bishop’s Palace. It became the home of Richard Devereux, the future Earl of Essex and close friend of Elizabeth I until his machinations led to a loss of favour with Henry VII’s granddaughter and his removal to the Tower. 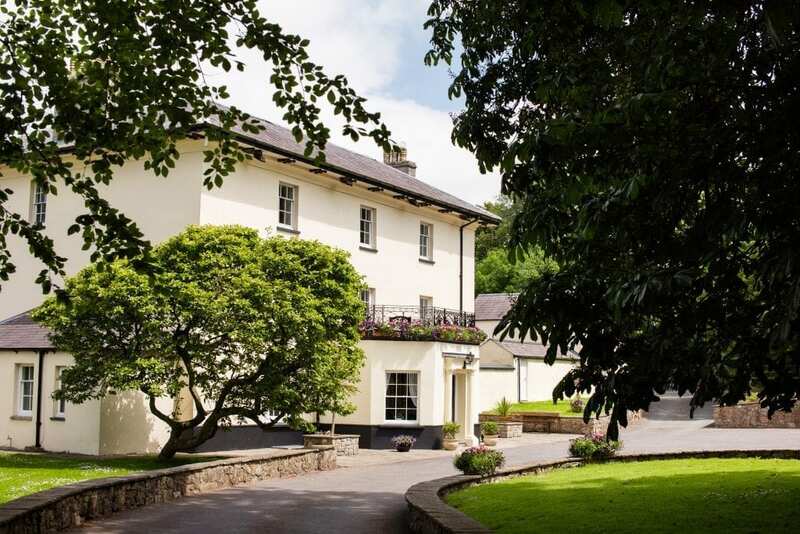 Now the Bishop’s Palace is hidden down a narrow lane leading to the luxurious Lamphey Court Hotel and Spa. When we had arrived the evening before – the mizzle temporarily abating – the National Trust ticket office was closed, and the lane ended with the hotel. This necessitated me to reverse the car – successfully – and park beside some local sheep who promised to stand guard over it. A narrow path led past some old walls inside of which I could make out the remains of the old palace. Having left my walking boots in Portclew House, I trod my way through the mud, over a narrow stream and through a low gap in the wall. Now, only a barbed wire stood between me and the fulfilment of my quest. Fortunately, I was not the only person to attempt this unusual assault upon the Palace grounds, as was evidenced by a small stretch of fence pulled back to ease my entrance. I strolled around furtively, before encountering a man coming towards me with a huge mastiff. Nervously, I greeted the stranger before asking him whether there were a more conventional route to the grounds. The man, who turned out to be a local farmer and came here each day to walk his daughter’s labrador, explained that the gate on the far side of the palace was left open all the time, as the National Trust found this system more economical than maintaining the ticket office. This was the more conventional, and dry-footed, means of access to the palace grounds. Now, relaxed I could take my time strolling around the wonderful ruins and get a sense of what it must have been like for young Devereux to meet the Queen of England here under the cloak of darkness before he lost much more than her favour. 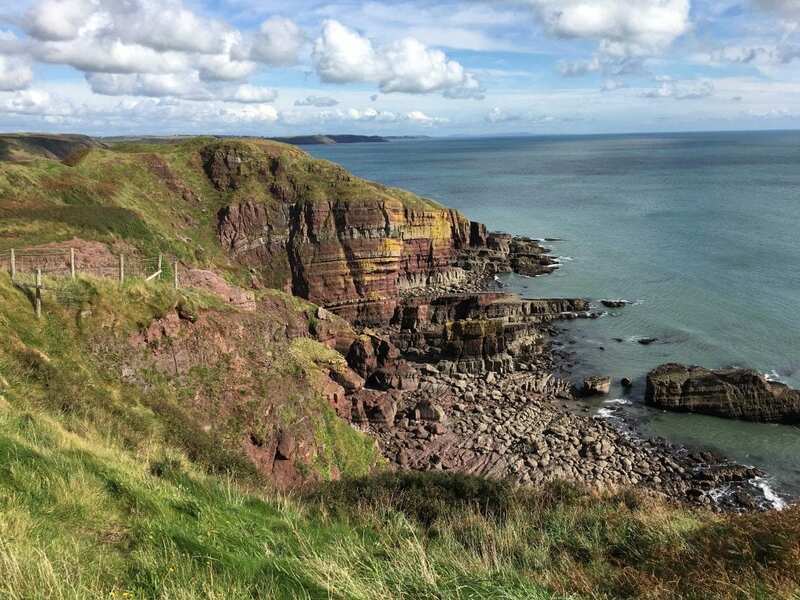 The first National Trail in Wales, the Pembrokeshire Coast Path opened in 1970. Stretching for 186 miles from St Dogmaels in the north to Amroth in the south, it features some of the most staggering scenery in coastal Britain. Ramblers pass through almost every kind of maritime landscape from steep limestone cliffs, undulating red sandstone bays, to volcanic headlands, beautiful beaches, estuaries and flooded glacial valleys. 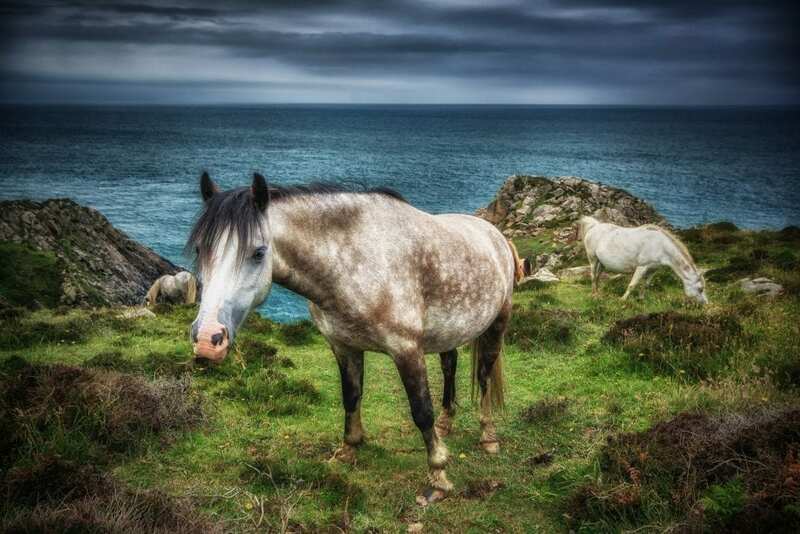 The trail lies almost exclusively within the Pembrokeshire Coast National Park, so there is an array of coastal flowers and bird life, as well as evidence of human activity from Neolithic times to the present. One of the highlights of any walk along the trail is a visit to St Davids, with its impressive cathedral and the ruins of the Bishops Palace. In 2012, the Pembrokeshire Coast Path became part of the Wales Coast Path – the world’s first uninterrupted route along a national coast. Covering 870 miles that really is a good hike. How Long Does It Take to Walk the Pembrokeshire Coast Path? It takes between 10 and 15 days to complete the whole of the Pembrokeshire Coast Path, depending upon your level of fitness. Fortunately, along the way there are many pubs for you to break up your journey or stay the night, and the coastal bus service, including the Puffin Shuttle, means you have no need to double back upon yourself. However, note that the service only runs twice a week between October and April so it’s best to plan your walk accordingly. Book your accommodation on the route at our Hotel Booking Portal. Back to the current day, and upon reaching Stackpole Quay, I decided against venturing off the coast path towards the village and its myriad of trails, and continued towards Freshwater East, pausing briefly to eat the fruit and biscuits I had relieved from the Portclew House earlier that morning – old backpacker tricks die hard. The day-trippers, seemingly incapable of venturing more than a hundred metres from one of the best beaches in the world, quickly dissipated, and I could admire the spectacular rock formations in the cliffs, with only the occasional nodding rambler to pass me in the opposite direction. Did this land really drift its away here from the other side of the equator leaving Africa behind some 400 million years ago, as the information boards claimed? My final destination was the third beach – Freshwater East. In most parts of the world, this would be deemed a pretty good beach, but along the Pembrokeshire Coast Path, it doesn’t even rank in the Top Three. Freshwater West on the other side of the artillery range is supposed to be great for surfing, and according to Sarah at Portclew House, who has lived in the area all her life, the area around Frainslake Sands, within the artillery range and only open outside the shooting season, tops the lot. And that’s without mentioning any of the other beaches along the 186 miles of coastline stretching up to St Davids and beyond. By the time I had completed my day’s trekking, I felt exhausted, and found it hard to believe that only a few months earlier I had been trekking in Nepal, such had been my self-indulgence over the British summer. And it is more self-indulgence I craved as I walked up the final stretch from the beach to the village, only to realise that this is West Wales and the pubs close between 2.30pm and 6pm. That evening the Freshwater Inn lacked the atmosphere of the previous night, when the Portclew Four came third in the quiz behind a team of locals and a visiting group of ornithologists from Costa Rica. So, I could reflect upon my two days in Pembrokeshire. This really is a spectacular part of the country full of amazing beaches, rolling landscapes, friendly locals and ruins steeped in history. Only next time I think I’ll leave the car behind and take the bus. Read Travel Begins at 40’s Essential Travel Guide to UK Holidays for the Over 40s. 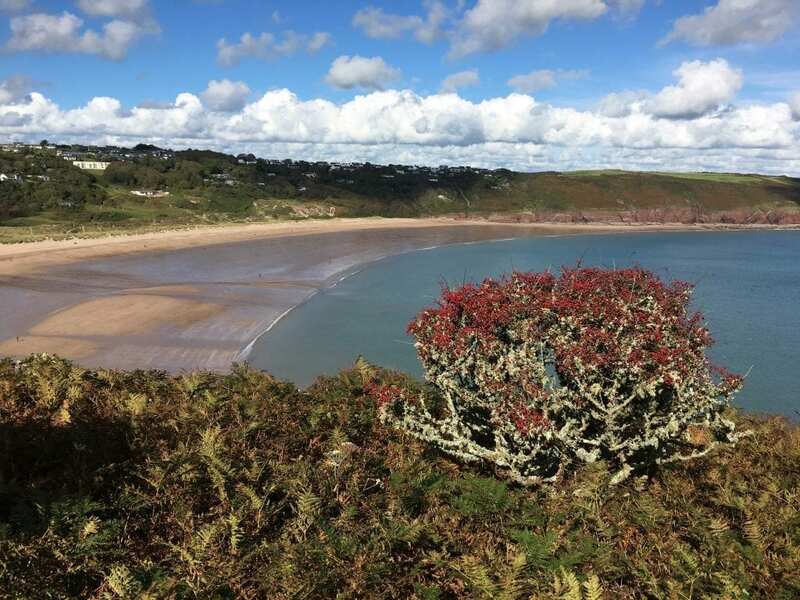 Mark’s walk is not the only one within the Pembrokeshire Coast National Park, for further ideas, click here. For further reading on walking the Pembrokeshire Coast Path, the Pembrokeshire Coast National Trail website is a font of knowledge. It helps us support the running of this website if you book your accommodation via our Hotel Booking Portal. You pay the same price as if booking directly with Agoda, but we take a small commission. The weather in Pembrokeshire and West Wales is notoriously unpredictable, with four seasons in one day not unknown. Before setting out on a trek along the Pembrokeshire Coast Path make sure you check with the current weather conditions. For more information on the whole Pembrokeshire, click here. 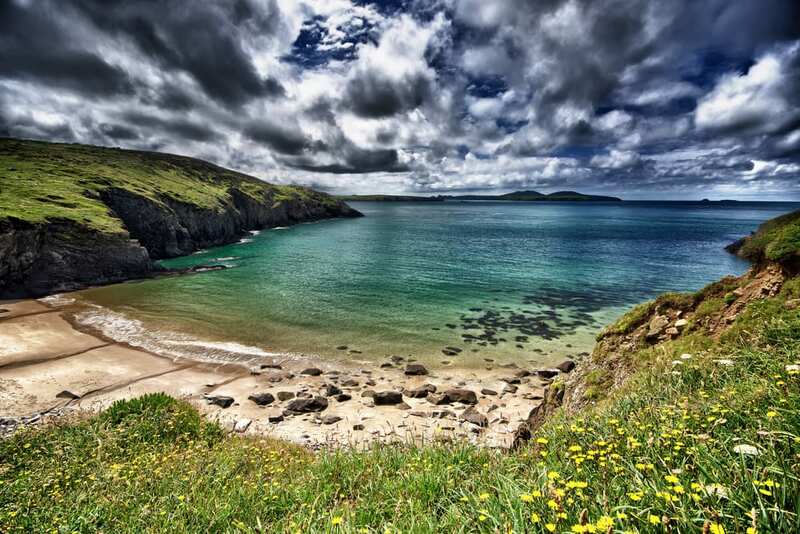 Can't get enough of Pembrokeshire? Click to for more travel articles, news, offers, and events about this stunning Welsh county.